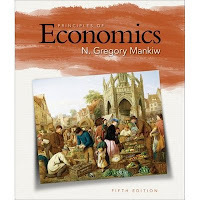 An economics instructor recently asked me how the new edition of my principles textbook, just published, handles the current financial crisis and economic downturn. Here is the answer, which might be useful to a few blog readers. Because events are still unfolding, any textbook will, necessarily, be somewhat out-of-date even before it is shipped from the printer. (That's one reason for this blog.) But the early stages of the crisis are covered in the new edition. Not surprisingly, the topic shows up in the macroeconomics part of the book. The chapter on The Monetary System includes a new feature on The Financial Crisis of 2008 that discusses the Fed's role as lender of last resort in the wake of the nationwide fall in house prices and rise in mortgage defaults. The chapter on Aggregate Demand and Aggregate Supply has a new discussion of The 2008 Fiscal Stimulus that aimed to give a boost to consumer spending. The chapter on The Influence of Monetary and Fiscal Policy on Aggregate Demand has a new feature called The FOMC Explains Itself which includes the Fed's explanation for its recent, substantial cuts in interest rates. The chapter on The Short-run Tradeoff Between Inflation and Unemployment includes a new section called Bernanke's Challenges which discusses the macroeconomic shocks the Fed has recently been dealing with. Overall, there are more than 40 new applications (as well as some more subtle pedagogical improvements) in the fifth edition, averaging more than one per chapter. The four new features listed above are those that relate most directly to recent downturn in the U.S. economy. Addendum: If you are a professor eligible for a free examination copy to consider for your classes, or if you have any other questions, the person at the publisher to contact is Brian Joyner. His email is Brian.Joyner@cengage.com.